A driver who police believe was under the influence of alcohol or drugs caused a head-on crash on State Route 520 early Thursday morning that left a woman hospitalized with critical injuries. A report from the Seattle Times indicates that she has since died from the injuries she suffered in the crash. Troopers say 25-year-old Michael Anthony Robertson was driving a Ford Explorer westbound on SR 520 at approximately 5:30 a.m. Thursday in the eastbound lanes. 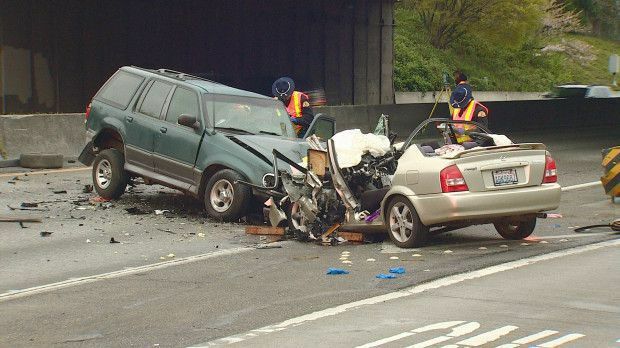 As he approached the Montlake exit near Interstate 5 driving the wrong direction, Robertson crashed head-on into a Mazda Protégé driven by 58-year-old Morgan Williams, who was driving eastbound in the same lane. Emergency responders arrived at the scene to find both vehicles with extreme physical damage and had to cut the roof off one of the vehicles to get a passenger out safely. She was transported to Harborview Medical Center in Seattle where she was listed in critical condition, but she passed away from her injuries shortly after her arrival. Robertson sustained significant leg injuries and was also transported to Harborview Medical Center. He had officially been arrested for investigation of vehicular homicide, as police believe he was under the influence of alcohol and/or drugs. Eastbound traffic was shut down for more than two hours because rescue crews had to work feverishly to extricate Williams from her vehicle. According to Washington State Patrol (WSP) spokesman Bob Calkins, Williams died shortly after her arrival at Harborview. The police investigation into this tragic DUI accident is still preliminary, but court records indicate that Robertson has been named as a defendant in multiple courts throughout Pierce, Thurston and King counties since 2003. If he is a repeat DUI offender, this will just be another tragic example of how easy it is for drunk driving accidents to happen when impaired drivers get behind the wheel and devastate families and loved ones.